Grow your email list and make money using online quizzes! 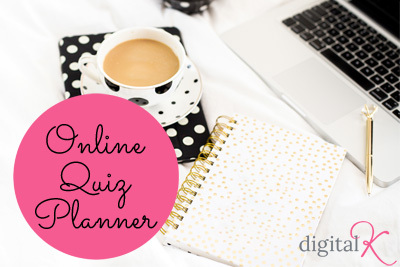 Use my Online Quiz Planner to plan and setup your online quiz. When done right, online quizzes can grow your email list and make you money! Just like with creating a website – the planning and strategy piece is so important to getting results for your business. Gone are the days of tossing a simple opt-in gift up and walking away, hoping that the emails will start flooding in. Now you need to up your game a bit. And that’s where this planner comes in handy! My Online Quiz Planner (38 pages) includes an in-depth, step-by-step plan for strategically creating an online quiz for your business. It also includes 19 accompanying exercises/worksheets that help you plan, create, monitor and improve your online quizzes. You will LOVE having this planner that you can print off and use in your business!